The purpose of equipment maintenance software (CMMS software) is to maintain equipment assets and to report on the maintenance program's performance. The software program directs all data back to the equipment item. This includes all labor, parts, and failure data. Understand and configure equipment hierarchy. Add data items (Departments, Locations, etc.) to hierarchy. Equipment descriptors are not the physical equipment item but rather are a text item that may be used to help create consistent equipment items. This is a key point that must be understood before proceeding with the equipment list creation. Equipment items are the actual physical equipment that work is performed on. 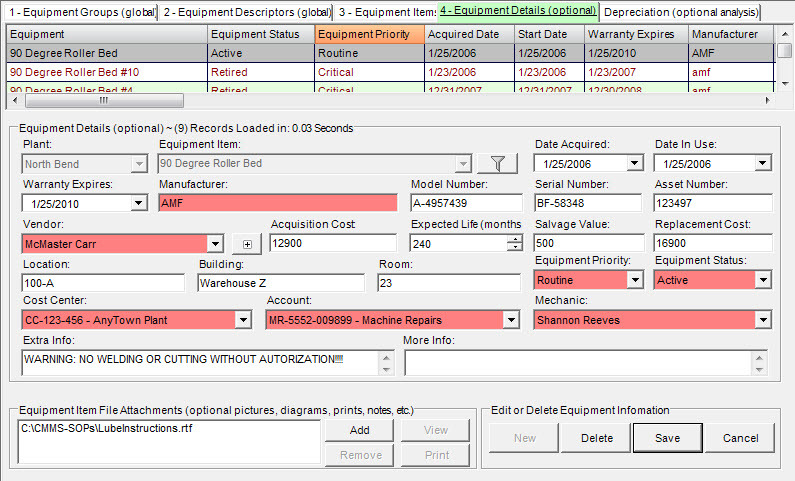 All data in the CMMS point back to the equipment item. Equipment items are placed in the equipment hierarchy and associated with an equipment group (equipment class). Equipment details provide an optional place to include many details for each equipment item. This includes unlimited file attachments of any file type. If further explanation is required contact CMMS University to schedule a personalized online demonstration of the software's analysis and reporting capabilities. Editing a Process, Line or Work Area/Location. What is an equipment group? What is an equipment descriptor and how is this different from an equipment item? Placing equipment in the equipment hierarchy. Equipment cost reports from equipment configuration screen. Adding file attachments to equipment items. What is an equipment item? Using spare parts against equipment.